Q. How do I find peer reviewed scholarly articles? For many topics, a good place to start your search for peer reviewed articles is Academic Search Complete. It has thousands of full text articles covering a wide range of subjects. First, type terms about your topic into the search box. Second, look at the limiters below the search box. On the right side of the page, check Scholarly (Peer Reviewed) Journals. Last, click the Search button. All of the citations you get will be from scholarly peer reviewed journals. The full article is available online for any citation which has a link for PDF or HTML full text. 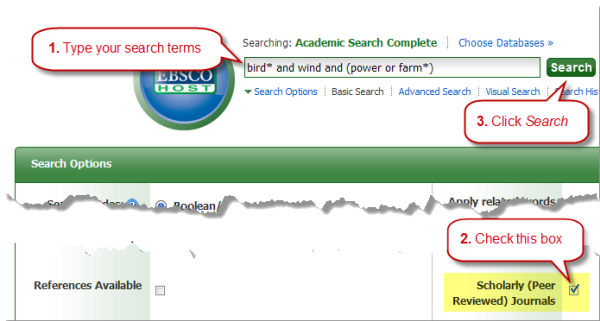 Most of the library's databases have an option where you can chose to search only peer reviewed journals. Unfortunately, there isn't a single place that lists which journals are peer reviewed and which are not. For more help finding peer reviewed articles, contact us at Ask a Librarian.